When I was nine years old, my father woke me from a sound sleep and carried me into my parent’s bedroom. Setting me in front of the TV, he said, “You need to see this.” It was July 20, 1969, and we watched rapt as Neil Armstrong made the first human footprints on the moon. I believe the indelible impression that this scene made on me came from two forces that have shaped my life ever since: curiosity and optimism. If we can land on the moon, we can go anywhere. What will we find when we get there? I think these are the same feelings that inspire many of us to find literary visions of the future so compelling. Like most science fiction enthusiasts, I developed my fascination in my early teens. Perhaps a person is more likely to be open to and bond with new ideas before adult habits and biases are formed. Two of the first authors that I encountered entranced me thoroughly, and led me to an enduring interest in the early days of the genre and the people and publications through which it developed. A close friend made me aware of E.E. “Doc” Smith that same year. I vividly recall my first reading of Triplanetary. The book begins with an epic sweep of history, seen through the lens of two ultra-advanced alien races who were manipulating humankind, each to their own ends. 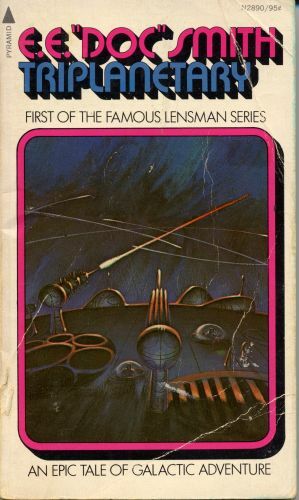 Through the seven books in the Lensman series Smith constantly raised the bar, introducing ever more fantastic aliens, technology and weapons. The battle scenes grew from individual ships to massive fleets… to conflagrations where the combatants were flinging entire planets at each other. The long build-up to the ultimate showdown of good versus evil was enthralling. I’ve since re-read these stories a number of times. Although they suffer from many of the unfortunate attitudes of the times in which they were written (“when men were men and women were women”), for me they still convey a sense of thrill and wonder. Both Lovecraft and Smith began their professional writing careers in the 1920s, the age of the pulp magazines. I sought out my first issue of Weird Tales on a lark, thinking it would be fun to see how a Lovecraft story had first appeared in print. 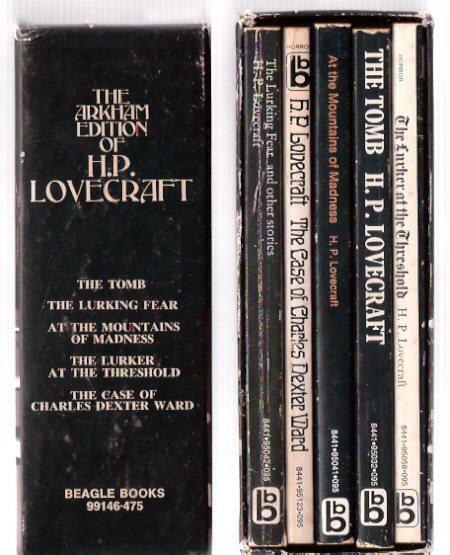 Thus began my slide into the deep crevasse of collecting early sci-fi and fantasy publications… I had to have ALL of the Lovecraft issues of Weird Tales… then I had to have ALL of issues of Weird Tales… and then I started on the first pulp appearances of Smith… and that’s how I encountered Cosmos. I was aware of early sci-fi “fanzines” because some of them published fiction, and occasionally they would scoop first placement of a story by a popular author. In an index of Doc Smith stories (thank you, ISFDB.org), I noted a Smith story named “What a Course!” – which turned out to be Chapter 13 of Cosmos. A little further digging and I was reading snippets describing the concept of Cosmos… an epic serial novel with contributions from seventeen different authors, many of them iconic, orchestrated by a young band of fans from a nascent mimeographed newsletter. Talk about optimism! My curiosity was severely piqued. In July, 2004 an exceptional opportunity arose to explore Cosmos and the context in which it arose. Longtime and leading sci-fi memorabilia collector Dave Kurzman contacted me and offered a complete set of Science Fiction Digest (later Fantasy Magazine), including all of the Cosmos inserts. Of course I couldn’t resist. Over the intervening ten years, I’ve had a chance to explore the ‘zine and Cosmos, and am more convinced than ever that it represents a unique window into the early emergence of sci-fi as a major genre. Moreover, Cosmos represents a very early and remarkable example of something we take for granted today: crowdsourced content development using social media. In this case, the “media” was paper sent though the US Post Office, and the “crowd” was formed in the letter columns of the science fiction pulps. Despite the obvious barriers, the intense curiosity and optimism of the organizers and participants carried the day. While the result may not be remarkably coherent as a novel, it is remarkable in many other ways. I look forward to sharing Cosmos with a broader audience, and welcome any and all comments, questions and suggestions. You can contact me here. Or, on to Chapter One of Cosmos! THANK YOU! This is a project that is almost 80 years over-due. The lay-out of your site is beautiful, and I cannot wait for the final portions to be posted. As someone who has never been able to read the entire Cosmos tale (I lack supplements 1-6) this is an absolute joy to find.